ysabetwordsmith | Poem: "Carrying On"
This poem came out of the August 7, 2015 Poetry Fishbowl. It was inspired by prompts from dialecticdreamer and tresta. It also fills the "curtainfic" square in my 6-1-14 card for the genprompt_bingo fest. This poem has been sponsored by Anthony & Shirley Barrette. It belongs to the series Frankenstein's Family. Victor and Igor rode down to the village. as mazil of the valley. or some hot bricks from the forge?" "Darling boy," Igor said with a smile. look askance at him because of his back. "I'll have some of those bricks, indeed." for all the good it would do in this weather. was as cold as the thirtieth piece of silver. both boys piled into the wagon. to the bay mare, and she settled. belonged to Artúr, where they all got down. you are allowed to take whatever you can carry,"
the mazil said to Nandru and Tivador. "How far do we have to carry it?" "Over the threshold, if it's indoors. Let's say twenty paces, if it's outdoors,"
your prize, so think carefully." did I do all right?" he asked. The stress had cost him a lot of his confidence. "You did fine," Igor assured him. a chance to benefit from creative thinking. I'm sure the boys will do well." ability to handle children fairly. they might sodding never heal. Igor had never met Victor's parents. filled with as many kidney stones as possible. a newborn draft filly slung over his shoulders. "All right, she's yours, put her down now,"
Victor said hastily, and Nandru obeyed. deep shoulder would stick with her. it will be several years before you can work her." gentle in my hand when she's big." "That shows good forethought, young man,"
Victor said, and Nandru beamed at the approval. "She's not just a dumb plowhorse neither,"
through with a Friesian stallion pulling his wagon." "Another crime to Artúr's credit," Victor said sourly. meant robbing his owner of the proper stud fee. or logging in the rough or pulling a carriage,"
Nandru said as he stroked her elegant nose. She certainly didn't look like a plain old plow horse. "You'll need to spend more time at the farm,"
for the new owner in exchange for her space." to make friends with a new farmer!" he said. mind pitching in for coin or barter." "I can see you've really thought this through,"
did you just take the biggest and best you could?" to be worth the bother," Nandru said. but enh, not as fine as this one!" and butted him in the crotch. "Hey! That's not your momma's teat,"
Nandru scolded, pushing her away. "She's probably hungry," Igor said. "Why don't you take her back to her mother?" of the filly's mane to lead her away. in a draft horse. He'd chosen well. under a whole bag of sugar. eating that all at once," Igor said sternly. Tivador set down the bag, then nodded. "Well then, you can do one of three things,"
Igor said, ticking them with his fingers. "Give it to your mother for your family. out over time so you don't make yourself sick. candy and share it with everyone." I didn't get any szaloncukor," Tivador said. "I'd love to share that with my friends." "We could certainly make some now,"
you very popular, at least for a little while." "A capital plan," Victor said. "Let's put the sugar in the wagon." the bag with a minimum of fuss. Then Tivador tugged on Igor's sleeve. when we were so sick." "Run and fetch that for Igor,"
"That will be a blessing to have,"
it is to heat a batch of bricks." "As the boy said, you deserve it,"
Victor said with a smile. "It was kind of him to spot it," Igor said. for errands with a five-pound bag of sugar,"
maybe they'd quit bullying me quite so much. I considered that a great success." a vertical line between them. "Tch. Ruffians." in his own way, more than of himself. with a fine china handle. "Now we've all got something,"
into the wagon with his haul. the friendly mother of his foal. "Next is the drawing, right?" he said. had been folded on the bench. and did that only with great reluctance. that it sometimes caused him. that anyone would pay such close attention. a little more relaxed on the reins. History includes many types of handwarmers. Igor is using the solid ceramic kind, similar to contemporary bread warmers. A better option would be a beanbag stuffed with ceramic balls or barley, being more flexible. According to an account in the Gospel of Matthew 26:15 in the Bible, Judas Iscariot betrayed Jesus for thirty pieces of silver. Restorative justice focuses on repairing the damage done to community and relationships. Since Artúr had no interest in making amends, Victor turned to a different source of restitution through the farm and its portable goods. Fortunately Victor's library contains many different volumes on law and politics, allowing him to choose things that fit his situation. You can find practice manuals for restorative justice online. Self-doubt can make people feel insecure about their parenting, leadership, or other skills. Know how to overcome it. Draft horses are bred for heavy work such as plowing, or lighter jobs such as pulling a carriage. Some breeds like Cream Drafts are more powerful, while Friesians can be smart and agile. The Cream is actually a later American breed, but cream and champagne draft horses appear in other breeds, so it could just as easily have emerged elsewhere. This is the Friesian/Cream filly. This is the other mare/foal pair on Artúr's old farm. A sense of community builds strong connections. Follow the steps to strengthen community ties in your area. Now compare what Victor and Igor have done in this gothic fluff series to what usually happens in gothic dark literature! It is precisely that attention to community ties, and involving everyone in local issues, that makes the difference in how well problems get handled. Szaloncukor is a traditional Hungarian Christmas candy made of marzipan dipped in chocolate. Bullying is a serious problem. Bribing a bully to leave you alone is a form of tribute, and it actually works great with some bullies; the drawback is that you have to keep doing it. (Once you have paid him the danegeld, you will never be rid of the Dane.) There are more effective ways to stop bullies, but not all methods are available to all victims. Igor probably used one of the best solutions within his reach at the time, physical force and appeal to authority being unfeasible. Here is the kind of copper foot warmer that Tivador found for Igor. It holds a scoop of hot coals, and people would take these in wagons or into church. This is the copper teakettle. 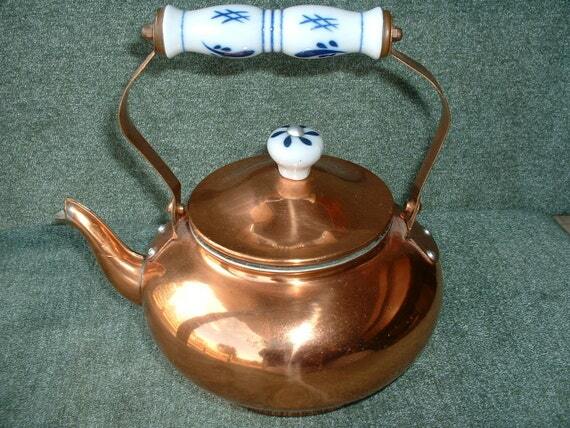 Among the materials used for tea kettles, copper is popular for its quick heating and low use of fuel. I'll admit to reading the sneak preview several times already, but I have to say that the links ADD quite a lot to the overall piece. Plus, I enjoy following the breadcrumbs, and find it a relaxing way to continue to think about the details in the poem. The boys each choose very different things, in part due to personality, but also as a reflection of their maturity. They both will learn very different lessons as a result. Thank you again for creating a village where they usually only carry pitchforks when it's time for haying, and the torches aren't about to set someone's house or fields alight. Nandru will learn about horses, farming, and close person-to-person relationships. Tivador will learn about candymaking, what "enough and plenty" feels like, how fun generosity can be, and a much broader, more casual exploration of relationships with lots of people. :D I fantasize a lot about places where people's needs actually get met and the neighbors look out for each other. That was lovely. I really enjoyed it. I love how thoughtful the two boys are and how they're both maturing. They have good examples. Nandru and Tivador are very different people, but good friends, and the adults around them are willing to coach development. Even Victor with his crappy background and shaken confidence does a capable job. I thought so too -- the power of a Cream Draft, the finesse and intelligence of a Friesian. She'll make a splendid light-to-medium draft horse in 4-5 years, although Nandru could probably start her on backpacking in half that time. I iz too tired. I saw your reply before, but this time in reading it I spoonerized the phrase to Dream Craft. I tink my mind iz tryna tell me iz time fo bed. LOL but such a cute image. I haz cat in lap. No... cat haz me on chair. Can not get up. Must resolve soon. Modern day grain warmers use rice, which is cheaper; however, in Victor's time, you didn't exactly have cheap container ship shipping, so barley would've been cheaper. I'm assuming that they've stockpiled the almonds for the marzipan? Might want to reference for the 40th piece of silver; I got the reference, but many of my Jewish friends and `ohana, among other people, might not. That's what I figured. They have some rice, but it's not cheap. Barley and corn both work; barley is cheap in plentiful throughout much of Europe. Whenever they get the chance, yes. Almonds are highly nutritious and have been available in Romania pretty much from the beginning, figuring into the local cuisine. Although they may not grow near the village, they should be reasonably available -- and Victor his significantly raised the local economy which affects what other folks can afford. They may wind up trading the sugar for other supplies just because processed sugar is so valuable. That was probably meant to have been Artur's supply from midwinter to early summer. Now compare what Victor and Igor have done in this gothic fluff series to what usually happens in gothic dark literature! As you say! This is a nice, sweet poem; I'm glad Igor is noticing that people are willing to care for him. He and Victor have done well toward making the village their own, and making themselves part of the village. And Victor is looked to for justice, rather than retribution, which I like.